Columbus Grove’s Garrett Nemire (40) shows off his moves during a scrimmage earlier this year. Nemire rushed for more than 800 yards last season. RETURNING STARTERS: Caleb Barrientes (WR/CB), Trevor Taylor (WR/S), Brady Hauenstein (TE/LB), Adam Bogart (WR/CB), Zac Ridenour (WR), Cody Johnson (OG/NG), Jared Basinger (OT/LB), Dylan Sargent (OG), Jeff Meyer (OG), Blake Reynolds (QB/S), Garrett Nemire (RB), Hunter Reynolds (DE), Ezra Jones (DE), Ethan Halker (LB), Riley Schumacher (LB). PLAYER TO WATCH: Caleb Barrientes led Columbus Grove in catches as a wide receiver, led the team in interceptions as a cornerback and punted last season. He will be busy again this season. Aug. 24 Pandora-Gilboa 7 p.m.
Aug. 31 at Leipsic 7 p.m.
Sept. 7 Patrick Henry 7 p.m.
Sept. 14 Paulding 7 p.m.
Sept. 21 at Crestview 7 p.m.
Sept. 28 Ada 7 p.m.
Oct. 5 at Spencerville 7 p.m.
Oct. 12 Delphos Jefferson7 p.m.
Oct. 19 at Allen East 7 p.m.
Oct. 26 at Bluffton 7 p.m.
COLUMBUS GROVE – A new season and a year of experience has brought a new atmosphere to Columbus Grove football, coach Andy Schafer says. The hope for the Bulldogs is that change will also results in a change on the field, where they won only two games last season. The biggest reason for optimism is experience. Nearly everyone in the starting lineup was a starter a year ago. Columbus Grove has full-time starters from last year back at 17 positions and five other players who started games in 2017. Offensively, Columbus Grove has its quarterback, leading rusher, top receiver and two other receivers who had more than 20 catches last year back for this season. The quarterback, Blake Reynolds, threw for 1,764 yards and 14 touchdowns last season as a freshman when he was honorable mention All-Northwest Conference. Running back Garrett Nemire, who was moved to running back from the offensive line last year, rushed for 808 yards and was honorable mention All-NWC. Wide receiver Caleb Barrientos, a first-team All-NWC player on offense and a second teamer on defense as a defensive back, caught 32 passes for 693 yards and scored six touchdowns. He also intercepted three passes and was the team’s punter. Another receiver, Trevor Taylor, was honorable mention All-NWC. He had 27 catches for 361 yards and scored four touchdowns. On defense, linebacker Riley Schumacher was second-team All-NWC and 380-nose tackle Cody Johnson received honorable mention. The defensive side of the ball is where Columbus Grove expects to improve the most. “Our offense kind of came a long way last year. I would say we progressed a lot through the year on offense,” Schafer said. “Defensively is where we’re going to see the most growth this year. “We changed our defense. We went from a 4-3 to a 3-4. We just felt like we had more numbers at linebacker and we’re putting big Cody (Johnson) at nose tackle. That’s going to force double and maybe even triple teams there and let our linebackers run free. “We’re excited to see what happens on defense. I think that is where we needed to make the most improvement and so far in practice it looks like we have,” Schafer said. Columbus Grove could get a good indication of how much progress has been made early when it takes on two teams who reached the playoffs last season the first two weeks of the season. 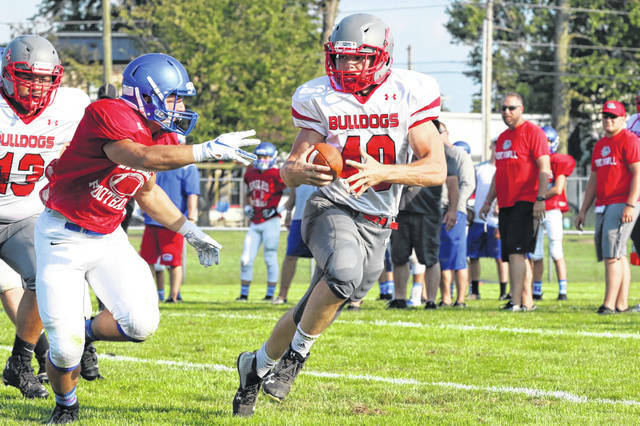 The Bulldogs are at home against Pandora-Gilboa on Friday night, then go to Leipsic next Friday. https://www.limaohio.com/wp-content/uploads/sites/54/2018/08/web1_Columbus-Grove-Preseason-Scrimmage-0180-2-.jpgColumbus Grove’s Garrett Nemire (40) shows off his moves during a scrimmage earlier this year. Nemire rushed for more than 800 yards last season. This entry was tagged columbusgrove, High school football preview 2018. Bookmark the permalink.